For centuries, the prevailing science has indicated that all of the nitrogen on Earth available to plants comes from the atmosphere. But a study from the University of California, Davis, indicates that more than a quarter comes from Earth's bedrock. The study, to be published April 6 in the journal Science, found that up to 26 percent of the nitrogen in natural ecosystems is sourced from rocks, with the remaining fraction from the atmosphere. Before this study, the input of this nitrogen to the global land system was unknown. The discovery could greatly improve climate change projections, which rely on understanding the carbon cycle. This newly identified source of nitrogen could also feed the carbon cycle on land, allowing ecosystems to pull more emissions out of the atmosphere, the authors said. "Our study shows that nitrogen weathering is a globally significant source of nutrition to soils and ecosystems worldwide," said co-lead author Ben Houlton, a professor in the UC Davis Department of Land, Air and Water Resources and director of the UC Davis Muir Institute. "This runs counter the centuries-long paradigm that has laid the foundation for the environmental sciences. We think that this nitrogen may allow forests and grasslands to sequester more fossil fuel CO2 emissions than previously thought." Ecosystems need nitrogen and other nutrients to absorb carbon dioxide pollution, and there is a limited amount of it available from plants and soils. If a large amount of nitrogen comes from rocks, it helps explain how natural ecosystems like boreal forests are capable of taking up high levels of carbon dioxide. But not just any rock can leach nitrogen. Rock nitrogen availability is determined by weathering, which can be physical, such as through tectonic movement, or chemical, such as when minerals react with rainwater. That's primarily why rock nitrogen weathering varies across regions and landscapes. The study said that large areas of Africa are devoid of nitrogen-rich bedrock while northern latitudes have some of the highest levels of rock nitrogen weathering. Mountainous regions like the Himalayas and Andes are estimated to be significant sources of rock nitrogen weathering, similar to those regions' importance to global weathering rates and climate. Grasslands, tundra, deserts and woodlands also experience sizable rates of rock nitrogen weathering. Mapping nutrient profiles in rocks to their potential for carbon uptake could help drive conservation considerations. Areas with higher levels of rock nitrogen weathering may be able to sequester more carbon. "Geology might have a huge control over which systems can take up carbon dioxide and which ones don't," Houlton said. "When thinking about carbon sequestration, the geology of the planet can help guide our decisions about what we're conserving." The work also elucidates the "case of the missing nitrogen." For decades, scientists have recognized that more nitrogen accumulates in soils and plants than can be explained by the atmosphere alone, but they could not pinpoint what was missing. "We show that the paradox of nitrogen is written in stone," said co-leading author Scott Morford, a UC Davis graduate student at the time of the study. "There's enough nitrogen in the rocks, and it breaks down fast enough to explain the cases where there has been this mysterious gap." In previous work, the research team analyzed samples of ancient rock collected from the Klamath Mountains of Northern California to find that the rocks and surrounding trees there held large amounts of nitrogen. With the current study, the authors built on that work, analyzing the planet's nitrogen balance, geochemical proxies and building a spatial nitrogen weathering model to assess rock nitrogen availability on a global scale. The researchers say the work does not hold immediate implications for farmers and gardeners, who greatly rely on nitrogen in natural and synthetic forms to grow food. Past work has indicated that some background nitrate in groundwater can be traced back to rock sources, but further research is needed to better understand how much. "These results are going to require rewriting the textbooks," said Kendra McLauchlan, program director in the National Science Foundation's Division of Environmental Biology, which co-funded the research. "While there were hints that plants could use rock-derived nitrogen, this discovery shatters the paradigm that the ultimate source of available nitrogen is the atmosphere. Nitrogen is both the most important limiting nutrient on Earth and a dangerous pollutant, so it is important to understand the natural controls on its supply and demand. Humanity currently depends on atmospheric nitrogen to produce enough fertilizer to maintain world food supply. 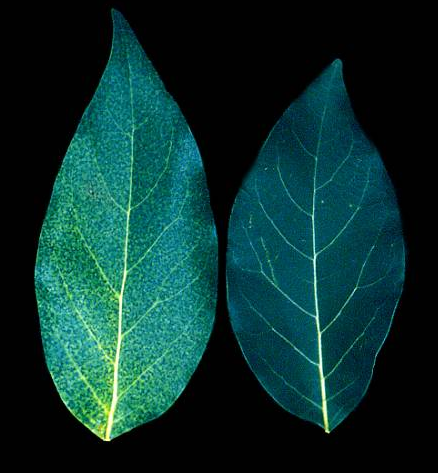 A discovery of this magnitude will open up a new era of research on this essential nutrient." UC Davis Professor Randy Dahlgren in the Department of Land, Air and Water Resources co-authored the study. The study was funded by the National Science Foundation's Division of Earth Sciences and its Division of Environmental Biology, as well as the Andrew W. Mellon Foundation. At a recent meeting the question came up about the fate of nitrogen fertilizer applied through the irrigation system. If it is applied as urea, how long does it take to convert it to nitrate? If applied as ammonium, how long does it take to convert to nitrate? Urea and nitrate pretty much move wherever water moves and is very susceptible to leaching. Because of the positive charge on ammonium, it is not as mobile as nitrate, but once bacteria transform it to nitrate, it moves with water. This is an important question, since if more water is applied than is needed by the plant, the nitrate is going to move out of the root system and no longer be available to the plant and ends up heading to ground water. Reading the literature, growers get the sense that all this transformation takes time, maybe a long time. It turns out that soils in coastal California have a pretty rapid conversion of nitrogen. Francis Broadbent at UC Davis did a bunch of studies back in the 1950's and 60's and found enzyme hydrolysis of urea to ammonium occurring within hours. 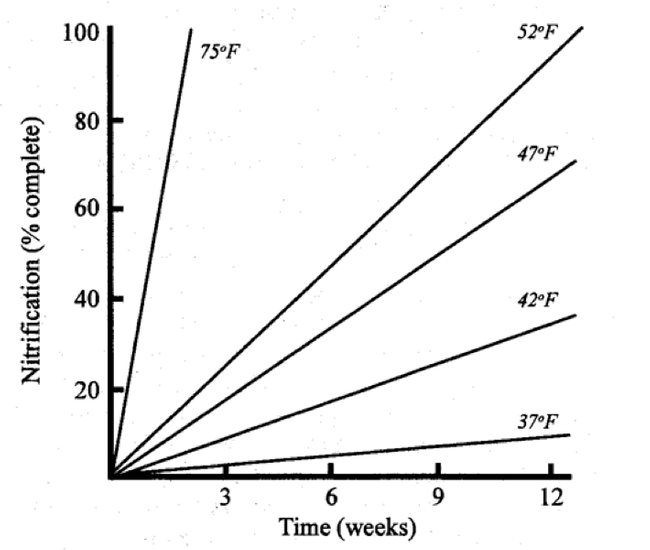 Other researchers have looked at nitrification, the conversion of ammonium to nitrate by soil bacteria, occurring within days and much of the conversion occurring within a week depending on soil temperature (see chart below). So there is all this nitrate present and the key is what happens to it. It turns out that most plants when actively growing absorb nitrate at about 5 pounds of nitrogen per day. So with a 100% efficiency, applying 20 pounds of nitrogen, all of it would be taken up in four days. Of course, nothing in nature is that efficient. But the point is a big slug of nitrogen applied is not going to be taken up immediately and if more water is applied after that than is needed by the crop, it likely is pushed out of the avocado root zone. Of course all the nitrogen a plant uses does not come from applied fertilizer. The bulk is coming from soil organic matter that is slowly decomposing. This nitrogen is being released at a rate that is probably in balance with the growth of the tree. The applied fertilizer, however, is much more unstable and needs to be handled accordingly. The rule of thumb is to break the irrigation application into thirds. In the first third, run the irrigation to fill the lines and wet the soil. In the second third, run the fertilizer. This spreads it through the system and onto the ground. The last third is clear the irrigation system of the material and to move the fertilizer into the root zone. Then given time, the tree will take up the applied nitrogen. At the next irrigation then the bulk of that nitrogen will have been taken up and little will be pushed through the root system.